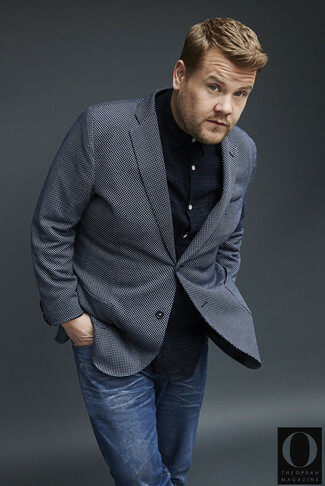 If you're on the lookout for a casual yet seriously stylish ensemble, try pairing a Michael Bastian navy plaid long sleeve shirt with dark brown chinos. As well as very comfortable, both of these items look great together. 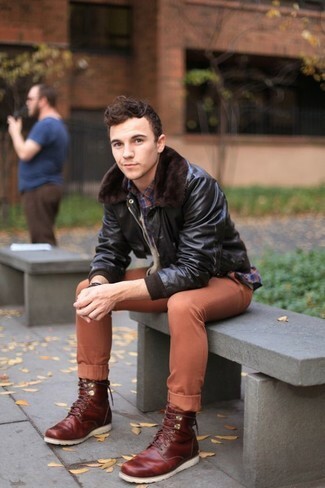 Sporting a pair of dark brown suede casual boots is a simple way to add some flair to your ensemble. 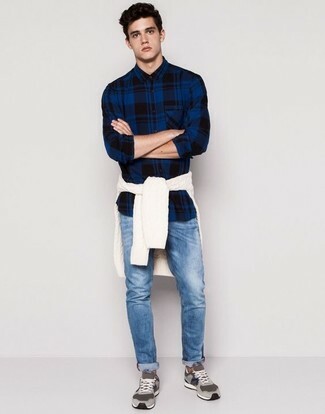 If you're on the hunt for a casual yet seriously stylish outfit, make a navy plaid long sleeve shirt and blue jeans your outfit choice. As well as very comfortable, these garments look fabulous together. Grey suede low top sneakers will become an ideal companion to your style. 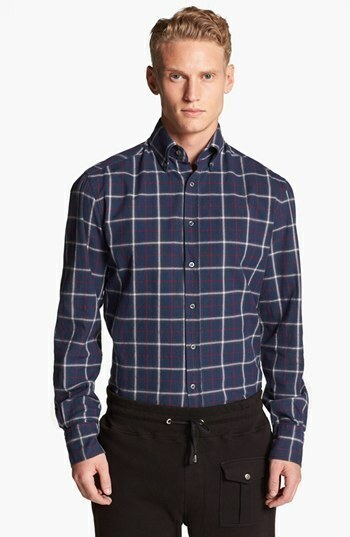 If you're in search of a casual yet on-trend look, consider pairing a Michael Bastian Michl Bastian Plaid Oxford Shirt from Nordstrom with navy chinos. Both items are totally comfy and look amazing paired together. 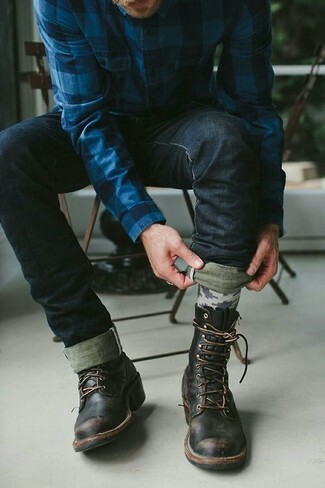 If you're searching for a casual yet stylish look, try pairing a Michael Bastian navy plaid long sleeve shirt with blue jeans. Both garments are very comfortable and they will also look great when paired together. Turn your sartorial beast mode on and grab a pair of black leather derby shoes. 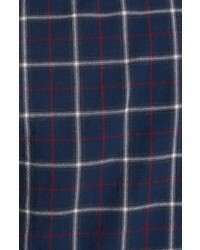 If you're in search of a casual yet dapper look, marry a navy plaid long sleeve shirt with tobacco chinos. As well as very comfy, both of these garments look fabulous together. Wearing a pair of burgundy leather casual boots is an easy way to add extra flair to your outfit. If you're on the hunt for a casual yet stylish ensemble, choose a Michael Bastian navy plaid long sleeve shirt and blue jeans. As well as totally comfy, these garments look great when paired together. 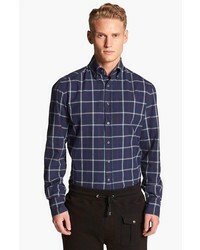 If you're in search of a casual yet on-trend outfit, pair a Michael Bastian navy plaid long sleeve shirt with navy jeans. Both of these pieces are super comfortable and they will also look incredible when worn together. 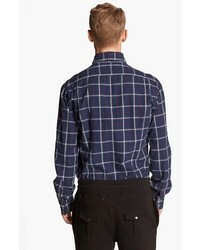 If you're hunting for a casual yet seriously stylish getup, opt for a Michael Bastian navy plaid long sleeve shirt and black jeans. As well as very comfy, both of these pieces look stunning when worn together. Got bored with this ensemble? Enter black leather casual boots to shake things up. 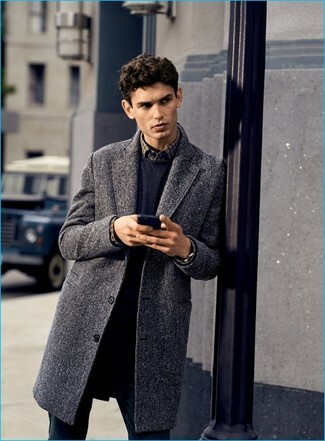 Dress in a Michael Bastian navy plaid long sleeve shirt and black skinny jeans, if you feel like comfort dressing without looking like a slob. To add elegance to your look, finish off with tan leather casual boots.